René Murat Auberjonois (born June 1, 1940) is an American actor and singer. On his mother's side of the family, he is the great-great-great-grandnephew of Napoleon Bonaparte, whose sister Caroline married Joachim Murat, one of Napoleon's generals. 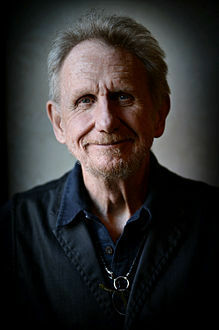 In films, Auberjonois has portrayed Father Mulcahy in M*A*S*H, and Chef Louis in The Little Mermaid, in which he sang "Les Poissons". In the American animated musical comedy film, Cats Don't Dance, Auberjonois lent his voice as Flanagan, the human film director of "Li'l Ark Angel", and in Fallout: New Vegas, to the mysterious Mojave mogul Mister House. But perhaps his most familiar role would be as Security Chief Odo in Star Trek: Deep Space Nine. Other TV roles have included Clayton Endicott III on Benson and Paul Lewiston on Boston Legal. He's also lent his voice to many animated series, including Challenge Of The Gobots (as Dr. Braxis), Pound Puppies (2010) (as McLeish), Pepé Le Pew in The Looney Tunes Show, and Desaad for the final two seasons of Super Friends (the Super Powers era) and many years later in Justice League (replacing Robert Morse from Superman: The Animated Series), where he also voiced space pirate Kanjar Ro. In 2018 he reprised the role of Odo for Star Trek Online's Victory Is Life expansion.